Frankenstein Slots is a thrilling video game with 5 reels and 20 paylines. It was introduced by the ever more popular NetEnt. The slot machine offers to test your nerves and play slots at night. If you dare, this will be one of the most horrible nights in your life! Anyway, the hot emotions will be paid well – not only for matching combos on the reels, but also for relaxing in the fantastic Free Spins Feature. As this slot machine is powered by NetEnt, you can play it only in no download version. This makes the game accessible only in a couple of clicks – you just need a browser and stable Internet connection. The horror of Frankenstein Slots is covered by night, and you can see it only when a lightning strikes the windmill. Dr. Frankenstein wants to create another Monster, and needs a good deal of your help for it. Help him make nice combinations and win some money for his new experiments. If you’re a lucky player, you’ll even win the top jackpot of 25,000 coins or $7,500! Every NetEnt game delivers great graphics, and Frankenstein Slots is not an exclusion from this rule. You will surely like featured icons, nice introduction video and breath-taking animations of this great slot machine. The game creates a very special atmosphere of mystery and fear. Pressing sounds also add a special scent of horror to the game, so if you want to tickle your nerves, try Frankenstein Slots, and you’ll get it! Are you excited if the professor will succeed with his experiments? Well, then you can help him make lucky matches with these featured icons appearing on the screen: Lightning Wild, Fire Wild, Windmill, The Monster, Dr. Frankenstein, Fritz, The Brain. Besides, you can make many matches with regular yet rewarding Nine, Ten, Jack, Queen, King, Ace. 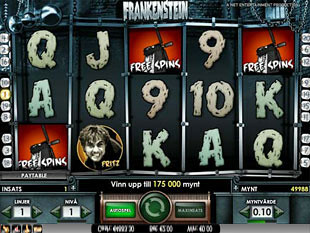 Frankenstein Slots are good both for careful players and high-rollers. The bets range in this game between $0.01 and $100. To change the size of your stake choose 1-20 paylines, and up to 10 coins with one of these values: $0.01, $0.02, $0.05, $0.10, $0.20 or $0.50. All these options allow you to try different tactics, and play risky, moderate and smooth game styles. The minimal bets vary in this game between $0.01 and $0.20. This sum depends only on the number of paylines you activate. The minimum of $0.01 is good for trying any slot machine, but if you want to have more chances for winning, we advise you to stake at least $0.20. The maximal bet of $100 is for really risky gamblers who like to win a lot at once. To get this stake, choose 10 coins of $0.50 and activate 20 paylines. 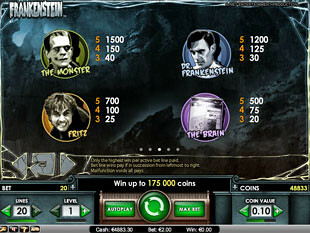 The highest Frankenstein jackpot is 15,000 coins or $7,500 for 5 The Monster symbols. The second Frankenstein jackpot is 12,000 coins or $6,000 for 5 Dr. Frankenstein icons matched. 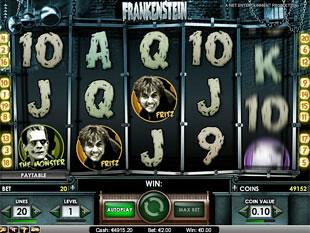 The third Frankenstein jackpot is 7,000 coins or $3,500 for 5 Fritz symbols. This game has two wild symbols – Lightning Wild and Fire Wild. Lightning Wild can appear only in regular mode, while the hot Fire Wild appears only during the Free Spins. Both these icons appear on reels 2, 3 and 4, and have a special feature – they turn 2 or 3 more nearby icons into wilds. This gives you a lot of new combinations, as every wild icon substitutes for any other symbol except scattered Windmills. 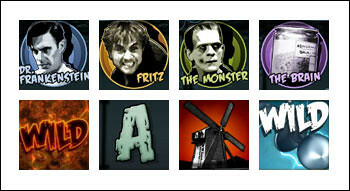 The scatter symbol of Frankenstein Slots is Windmill – you can catch it on any reel. Scatters make lucky matches in any position. In this slot machine Windmills don’t award you total bet multipliers, but you will play the crazy Free Spins Feature instead. Scattered Windmills appearing during the free spins will award you extra games, so the scatter icon is really worth hunting for it on the reels. Free Spins. The Free Spins Feature starts in the game when three or more scatter symbols are caught during one spin. The feature awards you 10 Free Spins with Multiplier. The Multiplier icon can appear on reel 5, and its value increases each time up to 5x. If the icon doesn’t appear during the spin, your wins are multiplied for the last number you caught. The maximal multiplier in the Free Spins is 5x. After this point the multiplier value is reset. Besides, you can get 5 or 10 Extra Free Spins for catching 2 or 3 scatters during the Free Spins feature. All-in-all, this bonus game is really rewarding – we managed to strike over $260 with only $5 staked! Note that the Fire Wilds are sticky in the Free Spins feature – if they appear when the reels are spinning, they stay on the same place till the end of the spin. Frankenstein slot machine is a terrifying video game that offers you to step into the dark night and make some lucky matches. For this it’s possible to play in regular mode and in Free Spins Feature. The game has unforgettable graphics, extremely high payouts, and interesting gameplay. Try Frankenstein Slots, and you’ll become its fan with the first spin!